Need a boat recommendation! Will be free skiing on large public lake. So, I would like 20-22 footer, open bow, decent slalom wake, I guess any wake will be better than my Cobalt's wake.It does need to be able to handle rough water while out cruising with family. I have a family of 4. So, it has to have room and storage. Budget 25k . What are my options? Thanks! I was looking for something similar, ended up with a Malibu Response LX for $14.5K Nautique 196 open bow, Response LXI would also be good. Prostar 197, there nice but a little low end the front, but good boats and there's some pretty good deals out there. I ski behind a 93 Prostar 205 reqularly, nice boat as well. Any malibu Sunsetter on the diamond hull would work as well. Early 2000s are in your price range. If on big water want the bow up some. Would be thinking Nautique 206, Malibu Sunsetter, or if need to go older the Prostar 205 mentioned above. Nice 206 probably priced higher than you want. Prostar 205 well within budget, Sunsetter probably the sweet spot. Comments I should of added on the Malibu Sunsetter. They came in many variants, LXI, LX, plain and there were even v-drives. The LXI will default to the ski hull. 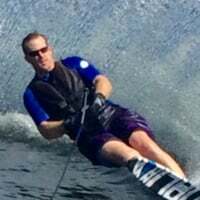 The others moved around depending on year and model but the non-diamond or "wake" hull does not produce wakes that are on par for progressing your slalom skiing. Just an FYI if you go the Malibu route. I skied behind a sunsetter lxi for about three years and really liked it. I ended up with a Prostar 197/x7 and love it. If on open big water, I would probably go with the sunsetter as the bow is a bit higher but if you find a good deal on a 197, try it out. They are really nice boats and some good deals are out there. Thanks! I would go for any of these boat recommendations, but I don't think my wife or other family members would like the engine in the middle of the boat.. Are any Vdrive boats ok for slalom skiing? Thanks again! My research is telling me that v drives really aren't that great for skiing.. Maybe I should look for an older DD boat just for skiing and keep the Cobalt for family use... I doubt that will fly with the wifey though. Lol! The engine in the middle really is not that bad. The Sunsetters, Nautique 206, LXi have decent room in them. I'd say if you had to that the v-drives would still be much better than the Cobalt. If your really wanting to ski I'd say give the inboard a chance. As Gregy commented, the midship motor box is not that much of a hindrance, my wife was also opposed when the shopping began and we ended up with a DD & she loves it (she also loves to ski). There are positives outside the wake that might be worth pointing out: much better getting on plane (faster), much less pitch to the boat when under propulsion, better handling & more nimble response. The direct drive does take an understanding on how to drive particularly at low speeds and reverse, which can be very different to an I/O, inboard, etc. Add the MC PS 209 to your list. Skis decently well and can handle big water. Consider a Mooomba as well. We have a Mobius LS - 2007. You can cross the wakes decently and if your coming off a I/O it is a night/day difference. Good luck! V drives are not going to be great for skiing, but everyone knows family first. Just about anything should be better than an I/O. V drives have a lot more storage room than a DD. Having a tower and rear ski locker helps get gear out of the way. With a family of four I'd say a DD would be just fine...its when your kids bring two friends is when it will get crowded, and a V drive will be preferable. When skiing with a DD everyone has to sit infront of the motor box, but with a V drive the pylon is behind the rear seat. With a family I'd also recommend an open bow. With that said I'd stick to a 21' boat for the extra room, I'd recommend the Malibu Sunsetter or Mastercraft 205. With skiing open water and being on a lake that can be rough you want a high freeboard (a lot of the ski specific boats do not have a high freeboard or bow), and something a little bigger to hand the rough water. You can get a Sunsetter with a v drive and a diamond hull, which might be the best balance, but won't be as good of a ski wake as the DD. There's one non-open bow boat that would serve your purpose, but they're not made anymore so they are pretty hard to find and that's a Sanger TX. Anyone who has one (I'm one!) loves them and you don't see them for sale very often. It's a 21 foot I/O that will ski better than any V Drive out there. Ordinarily, I agree with the sentiment that I/O's are not good for skiing, but this is the one exception since it's basically a tournament hull with lots of interior room. And it's a kick in the pants to drive! Just a thought. I live on a pretty big public lake in AR, and the water can get rough on holidays when a lot of people are out boating. I would want a multipurpose ski boat that could handle the lake and not take on water over the bow.. Just looking for a boat that can haul my family around when out pleasure riding and have a wake that is better to ski than my Cobalt 200. On holidays I just go very early or I give it up to the Walleys and Fidgits. Cobalt made a 202cs, open bow inboard. Same Cobalt quality in a direct drive. I had a 2000 MasterCraft Prostar 205. Great boat based on the 1995-1997 Prostar 190 hull. 15 off was decently soft. Bump at 22 off. 28 off and up was every bit as good as the 190 it inherited from. Tracked like a freight train in the course. Not as nimble as the 190 for cornering, but super solid through the course. Great storage and a lot of room in the bow. I only sold it to get a boat with Zero Off and I have missed it at various times. How is the 1999 PR 205 wake for skiing? Will be skiing at 15off on public lake. The 1999 205 should be the same as the 2000. Those years used the 1995-1997 PS 190 hull with changes mainly above the rub rail and to the interior. 15 off was decent behind my 2000. I'd recommend a Malibu Response LX, but I think you would have issues with the rougher water that you said you were concerned about. The 205 has higher gunwales, takes rough water a bit better, and is less likely to dunk the bow - though you can do it with a few people up there and decelerating right into a roller (not that I would know or anything). By the way, the 2000 PS 205 was AWSA tournament approved. Not sure if the 1999 was, but I don't see why not. Ok thanks. I found one locally that has 212 hours on it for $18500. I'll probably go look at it. @mikey, remember to inspect it, drive it, listen to it, and ski it (if at all possible). Ask the big questions about care, lake water quality, maintenance history (including recent steering cable replacement). Watch the gauges or alarms. Good luck and I hope it works for you. - Malibu Sunsetter LXI - Early 2000's, diamond hull, great ski wake, open bow, etc. - Malibu Sunsetter XTI - Same hull and ski wake, different interior layout. - Malibu Sunsetter VLX - Early 2000's, make sure it has the diamond hull (some don't). - Mastercraft 205v - This hull was around for a long time, eventually turned into the X1.